Marcille's musical interests have taken her from the grand opera houses of Europe, to one-room cabins in remote coves of North Carolina, to the Wonderful World of Disney! Native Floridian Marcille Wallis is a classically trained pianist who began her musical studies at age six. Using her polished skills and talent she added the guitar and eventually the hammer dulcimer as well as other folk instruments to her repertoire. As a full time professional hammer dulcimer player, Marcille has toured the country entertaining at fairs, festivals, churches, concerts, pubs, bookstores, workshops and private functions. Drawing on her 23 years in the classroom as a Mathematics teacher, Marcille's shows are both entertaining as well as educational as she takes audiences on a "tour" of the Celtic lands and their history. With ten CD's to her credit, Marcille's music can be heard on radio stations and Internet broadcasts world-wide and on PBS Television across the U.S. Marcille plays as a soloist but most often performs in small ensemble and with a full show band which includes a wide variety of musicians as well as a superb Irish dancer. In the period spanning 2000 to the present, Marcille has produced three concert series including "Christmas With the Celts," "My Heart's In The Highlands (a musical tribute to Robbie Burns)," and a high energy St. Patrick's Concert Series. In addition to all this, Marcille is also the founder and nucleus of Celtic Festivals, which she produces every year with her company, Celtic Heritage, LLC. Born and raised in sunny Florida, I began to study classical piano at age six. I developed an early love for folk music by taking up the guitar at age nine and soon afterward formal piano recitals contrasted gigs featuring "The Manatee Avenue Demons," a group of neighborhood kids who played sandlot baseball by day and Bob Dylan tunes at night. As a teenager I broadened my musical horizons even further and was afforded the chance to study for a summer at London, England's Royal Academy of Music. My instructors there were some of the same people who had taught Elton John and collaborated in songwriting with Paul McCartney! I have played in professional capacities since I was a teenager, accompanying singers and instrumentalists of many different musical genres, from country singers to aspiring rock stars to operatic sopranos. For many years I was organist in my childhood church (First Baptist Church of Arcadia, Florida) and I've anchored the orchestra at piano for a number of Broadway-style musicals. An interest in early music led me to take up the dulcimer in 1991. I attended Asheville, North Carolina's inaugural "Swannanoa Gathering," an annual series of folk arts workshops internationally known as an inspiration for serious students of traditional acoustic music. I've since attended five additional "Gatherings" experiencing Old-Time Week, Dulcimer Week, and Celtic Week, and have assisted Maggie Sansone in the teaching of a beginning hammer dulcimer class. Working with Port Charlotte guitarist Anthony Delle Donne I began making presentations in Charlotte County, Florida, schools. Out of this collaboration grew an invitation for us to play at the newly opened Celtic Ray Public House in Punta Gorda, Florida, in 1997. Drawing upon our shared love of music and my years in the classroom, we formed a band, naming it "Ceol Binn," which is Irish for "sweet music." 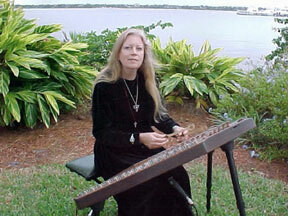 The hammer dulcimer is a musical instrument with truly ancient origins. No one can say for certain when the hammering or beating of strings to produce music first began, but many cultures around the globe have an ancient musical heritage that includes an instrument resembling, in both sound and style, my own dulcimer. The direct ancestor of the hammer dulcimer is the psaltery, known to have originated in Asia Minor over 5,000 years ago. Many scholars believe that the dulcimer originated in Persia (what is now Iran) somewhere around the 9th century. The dulcimer migrated into northern Europe during the Middle Ages, brought from the Middle East by returning Crusaders. Tradition in Mongolia says that the dulcimer (what they call joochin) originated in their country and was brought to Iran in the 13th Century, during the invasions of Genghis Khan. An alternate theory suggests that the dulcimer is a product of Medieval France. Most intriguing to me is the evidence that an instrument very similar to a dulcimer actually existed in Biblical times. A musician playing a hammered, stringed instrument appears in an ancient Assyrian bas relief, and since the modern harp was certainly not in existence at that time, it is very possible that this hammered, stringed instrument was the "harp" played by King David! The term "dulcimer" evolved from the Latin "dulce melos" - sweet sound. Historians surmise the dulcimer was the inspiration for the piano. My dulcimers are crafted by master builder Sam Rizzetta of Inwood, West Virginia. For more information on the dulcimer (both the hammer variety as well as the mountain), visit "Everything Dulcimer," where you can find a teacher, a club, links, and much more.